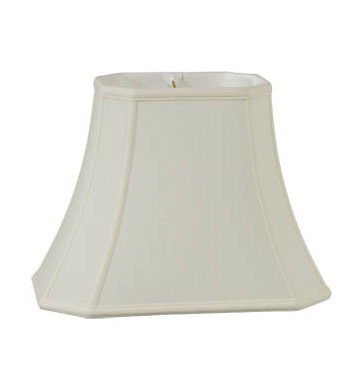 These Eggshell Cut Corner Rectangle style Softback Shades are available in the following colors: Off White, Eggshell & Black. The Off White, Eggshell, & Black colors are Tissue Shantung. The Off White, Eggshell color shades are lined in off white color satin material. The Black color shades are lined in double gold color satin material. These shades have a 1/2" fitter recess. No reviews yet for the Eggshell Tissue Shantung Cut Corner Rectangle.